My Dear Readers, I have really caught the bug of domesticity over the last week or so. If you have been reading this blog for any length of time, then you know that I am a huge advocate of do-it-yourself projects. However, I have really put on my homemaker shoes lately by making a ton of fermented things (which I will likely discuss in future posts), as well as to start making my very own homemade body care products. I have wanted to start making my own body care products since becoming more and more disheartened by all of the chemicals that are in commercial products. The truth is that there are all sorts of “trade secret” ingredients that manufacturers aren’t even required to put on the labels that consist of who knows what chemicals. Even the “all natural” and “organic” products, while generally better than the conventional kind, tend to be rather costly or it can still be difficult to identify all of the ingredients that they contain. The skin is actually the largest organ in the body, and it essentially absorbs whatever we put on it into the bloodstream. Then, whatever compounds we have absorbed into our body travels around and can get stored in our organs and other places if they don’t get used or excreted out somehow. This should give us pause to think about all of the things that we put on our bodies. Knowledge of this fact has transformed my choices concerning the products that I use, and I try to choose the most natural products as I can given what I can personally afford (which admittedly isn’t a lot). I am not a very “girly” gal, and so I prefer the basics when it comes to the personal care products that I use. I am also not one to sit in front of the mirror every day primping for hours. While I don’t want to look like a hairy, disheveled, and stinky monster, I have much better things to do with my time than to primp my life away. I do, however, believe that beauty starts from the inside, not just from our souls and what sort of person that we are, but also from whatever we are eating. If we are eating a healthy diet with lots of antioxidant-rich foods and other healthy whole foods, we will have much healthier complexions and bodies, and these foods help to keep our bodies looking younger. Conversely, if we are eating poorly, our skin and the rest of our appearance will be affected negatively. It amazes me how many people, especially many women, focus so much on buying expensive beauty treatments and cosmetics, but they often completely overlook what they are putting into their bodies from the food and the beverages that they are consuming, which quite often is the basis of beauty (and health) in the first place. I believe that beauty really must start from the inside first. For a moisturizer on my face every morning and evening, I use unrefined virgin coconut oil, and it works like a dream. While it may seem greasy at first, the oil quickly gets absorbed into your skin and you will benefit from the many healthy properties of coconut oil, which include tons of antioxidants and antimicrobial elements. I have also recently gotten back into doing oil pulling using coconut oil, which has seemed to clear up my skin quite a bit. I recommend the book Oil Pulling Therapy written by Dr. Bruce Fife if you would like to learn more about this simple and inexpensive natural health practice. Due to my interest in the healthy properties of coconut oil and the fact that I always have a steady supply of it my kitchen to use as my primary cooking oil, I was excited to discover several recipes for making some of your own body care products using it. The ones that I have tried so far are for making coconut oil deodorant and coconut oil lotion bars. Since we have plunged into temperatures below freezing over the last week and now have snow where I live, we have to keep our skin from getting chapped and dry. Fortunately, coconut oil works well for this purpose, and I decided to give the lotion bars a try by using this recipe. While the lotion bars are more reminiscent of an ointment in consistency, and it takes a bit of work to get it spread and absorbed into the skin, it seems to keep my skin well moisturized. The bars were fairly easy to make: just take equal portions of both coconut oil and beeswax, mix them together and melt them, and then add your choice of essential oils. I poured the hot liquid into a muffin tin (you could use molds or other containers instead), let them completely cool, and presto, there were lotion bars! Since I made them myself, I was able to add whatever essential oils I wanted to. I, of course, started with one of my most favorite scents in the entire world: lavender. I was excited that I didn’t need to go out and buy any commercial lotion that day. I am hoping to make some actual homemade lotion soon as well, but since I didn’t have all of the ingredients on hand to do so, the lotion bars still saved the day as well as my dry skin. I also made some coconut oil deodorant using this recipe. Fortunately, I had all of the ingredients on hand: coconut oil, baking soda, GMO-free cornstarch (I prefer GMO-free corn products), optional essential oils (I chose lavender again on this one), and arrowroot powder (this ingredient will likely sound familiar to my gluten-free comrades out there, but for those of you who aren’t gluten-free, you should be able to find some in the gluten-free baking ingredients area of a natural food store or hopefully your local grocery store). I did find that I had to add a little more coconut oil than the original recipe called for to equal a frosting-like consistency. My advice would be to add one additional tablespoon of coconut oil at a time until the mixture reaches your desired consistency. I wasn’t sure how well this deodorant would actually work, but so far so good, as it has kept my underarms dry and non-stinky all day long. I did decide to try this on a weekend, since I’m not sure how well it would work during a typical workday during the week. My plan is to try it out and keep my regular Tom’s of Maine brand deodorant with me just in case. I had to apply it with my hands like a lotion instead of using a “stick” like your typical commercial deodorant. This is now being stored in a jar in my bathroom cupboard. Here are some pictures of my body care product making adventures this weekend. I hope that they are helpful to you and will encourage you to start making some of your own homemade body care products as well. They are natural and healthy alternatives, easy to make, and you will be able to identify all of the ingredients that you are putting on your body. Score! Equal portions of coconut oil and beeswax beads. I started out adding ¼ cup at a time of each, and added an additional ¼-1/2 cup of each to increase the total volume. Mixing and melting the beeswax and the coconut oil in a pot of boiling water within a pint size mason jar. After awhile (I estimate that it took about 5-10 minutes), the beeswax and the coconut oil were melted. The coconut oil melted much more quickly, and it took several additional minutes for all of the beeswax to melt. Fear not, it will all melt eventually. Everything will be a clear liquid when this process is complete. I added a few drops of lavender oil and pure vanilla extract to the hot liquid. After pouring the hot liquid into a muffin tin. Whisking together all of the dry ingredients. After adding the initial 1/3 cup coconut oil and 5-10 drops of lavender essential oil. I found that it still needed a little additional coconut oil to achieve my desired consistency. After adding 1-2 tablespoons more coconut oil. This resembled the consistency of a thick frosting. The finished deodorant in a glass jar. 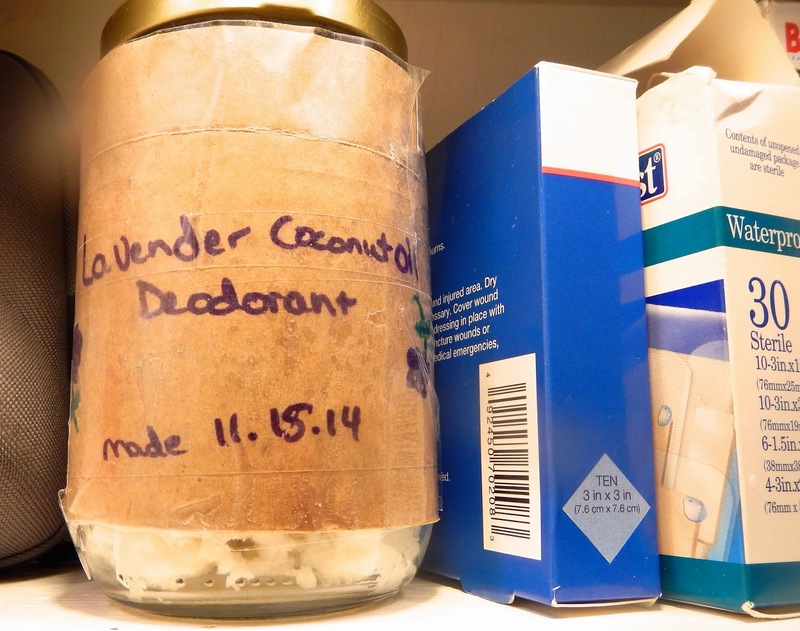 My homemade lavender deodorant on my bathroom cabinet shelf! Oh wow! That a fabulous.. you make your body products on your own! We prefer to Buy Body Care Products Online most of time... Well loved you work.. keep it up. all the best ... Thanks. Thanks Tristan! My goal is to eventually make almost all of my own body care products myself. This is cheaper than commercial products, I know exactly what is in them, and I can make them to my own preferences. I find that making these things is pretty empowering- no more worrying about what toxic waste is in the things that I use for my body. My favorite so far is the calendula lavender lotion that I wrote about on 1/20/2015. Check it out! I encourage you to try making some of these things yourself. You may never go back to commercial products again. We’ve Got the Beet (Beet Kvass, That is)!